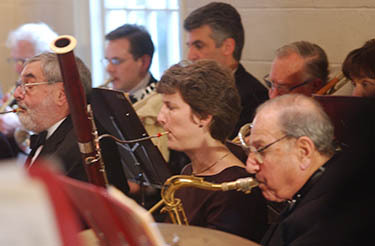 Despite a gray, rain soaked Massachusetts Spring it was warm and cheerful inside St. Mary’s School Hall as the Parkway Concert Orchestra celebrated the concluding concert of its 60th season! 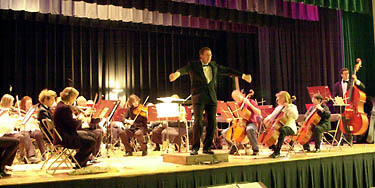 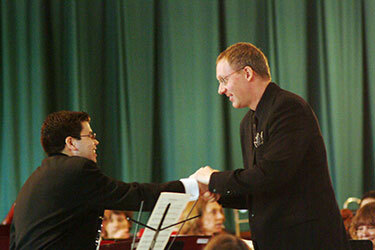 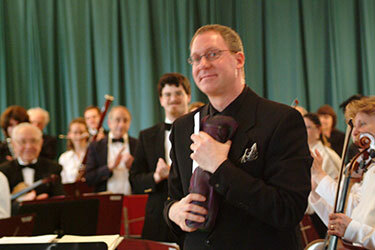 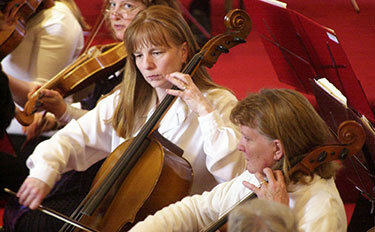 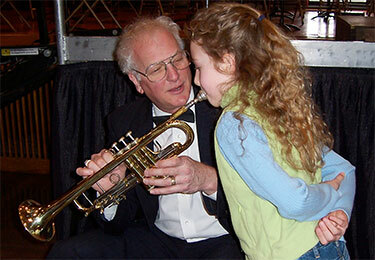 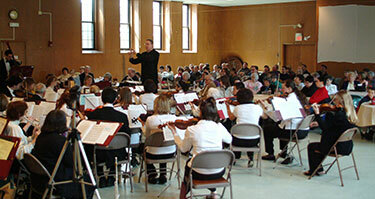 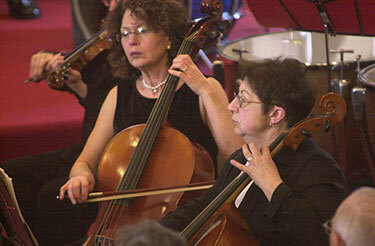 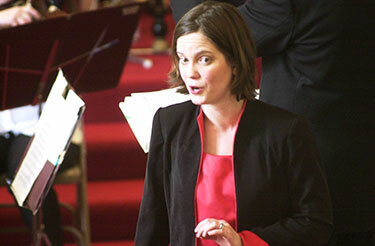 The Parkway Concert Orchestra dedicated this concert to honor the memory of long-time member Frank Grenier. 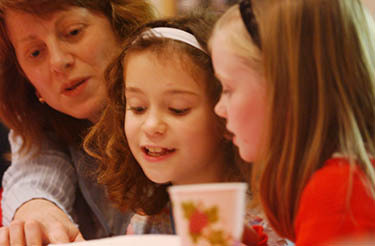 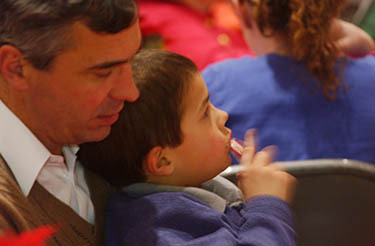 We were delighted to welcome a number of Frank’s family that afternoon. 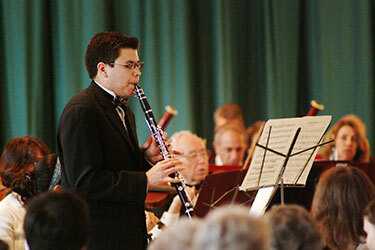 The Orchestra was also delighted to welcome Clarinet soloist and recent Boston Conservatory graduate James Johnson. 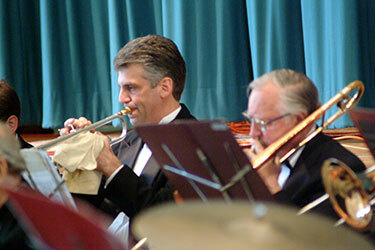 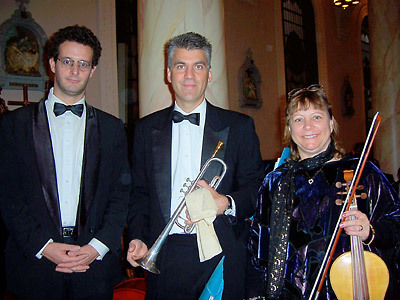 A trio of the Orchestra’s Trumpet section performed a dazzling rendition of Leroy Anderson’s Bugler’s Holiday. 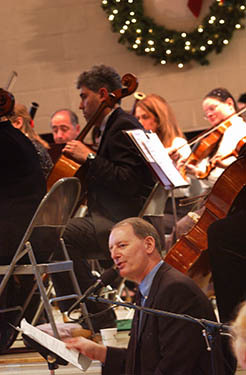 The conclusion of the Orchestra’s 60th season also marked the conclusion of Lawrence Isaacson’s tenure as Music Director and Conductor. 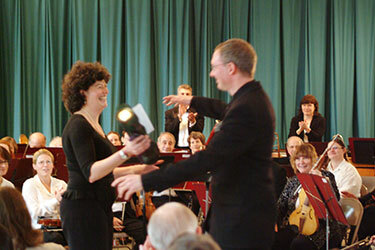 French Horn section leader Adele van den Bosch spoke for the Orchestra with a moving tribute to Mr. Isaacson and a gift as a token of their appreciation for his effort and achievements. 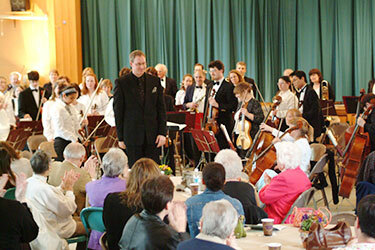 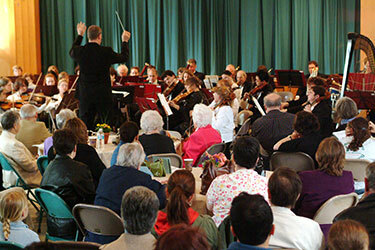 The Orchestra never sounded better than they did on April 3 in Westwood. 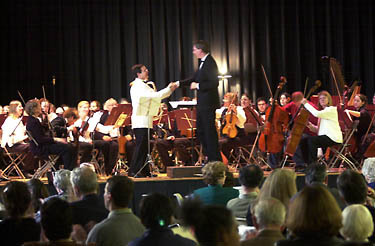 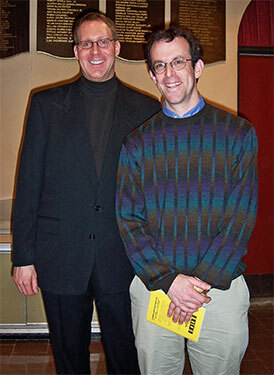 Parkway Concert Orchestra conductor and Music Director Lawrence Isaacson (left) with composer Allen Feinstein. 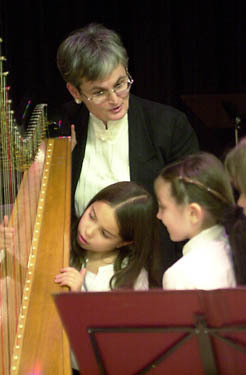 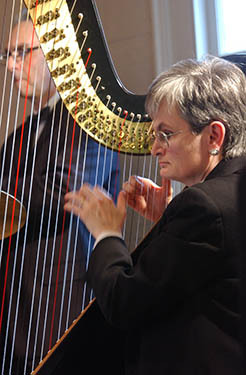 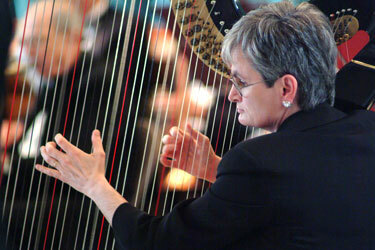 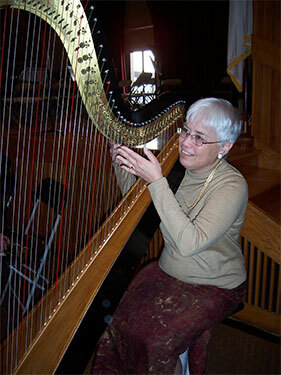 Betsy Kam settles in with Ellen Fox’s harp. 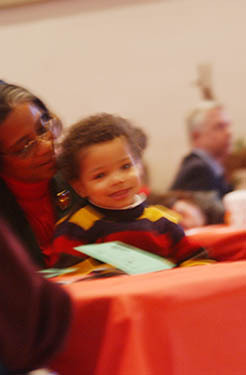 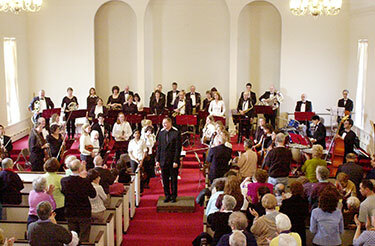 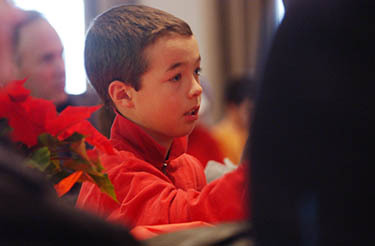 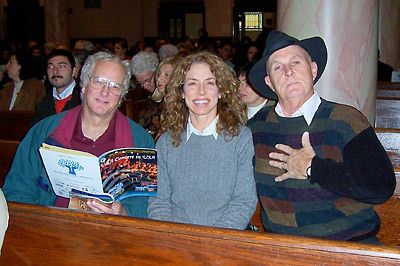 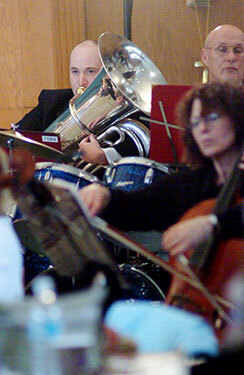 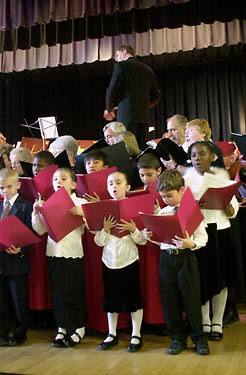 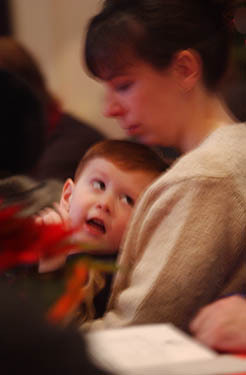 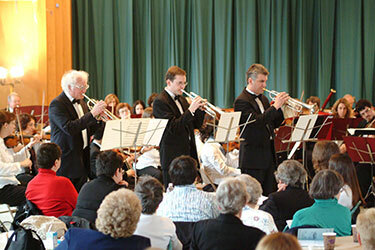 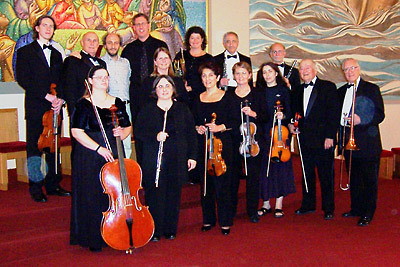 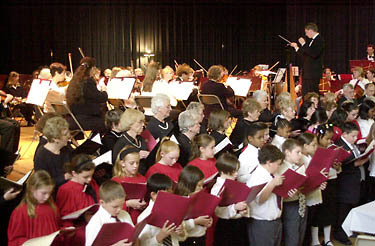 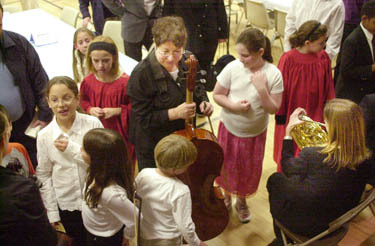 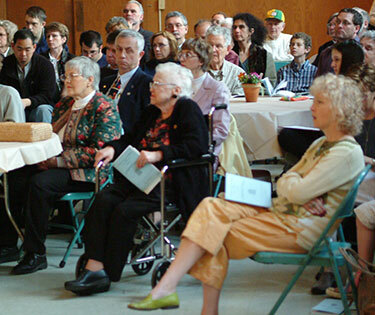 The Orchestra presented its final performance of 2004 at the First Congregational Church in Norwood, and an exhuberant, festive event it was indeed! 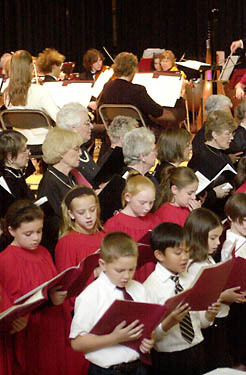 Among the many highlights of the Holiday Concert was the narration of ’Twas the Night Before Christmas by the guest artist (and Pastor of the host Church), the Rev. 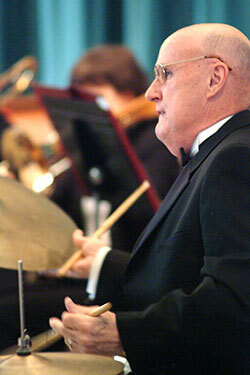 John Hamilton! 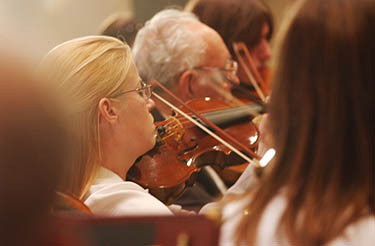 Following are some glimpses of the orchestra working their magic. 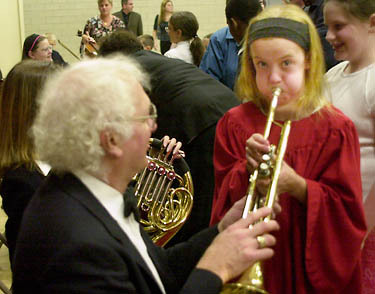 It’s hard work to make great music appear effortless! 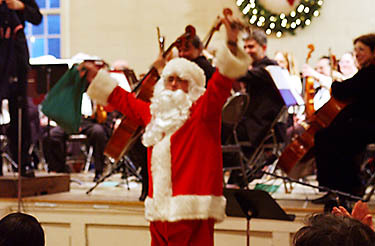 And really — what sort of Holiday Concert would it have been without the appearance of a very special “special guest”, passing out candy canes and holiday cheer? 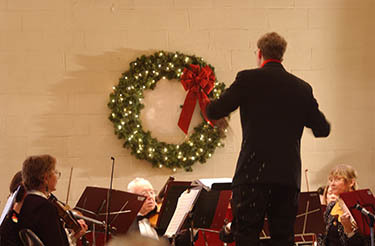 No one really cared that Norwood wasn’t a Winter Wonderland as long as St. Nick found his way to the Concert! 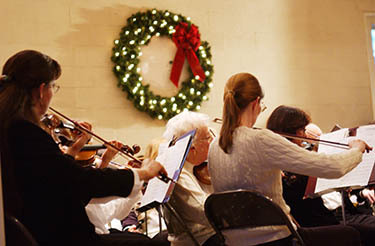 Happy Holidays to you all, From the Parkway Concert Orchestra! 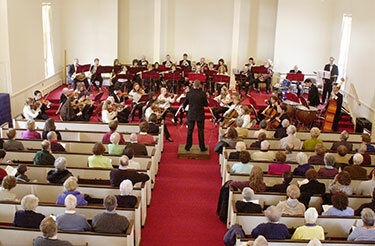 The Orchestra had the pleasure of performing two movements from Gounod’s Messe Breve in C together with choirs directed by Dr. Richard Bunbury. 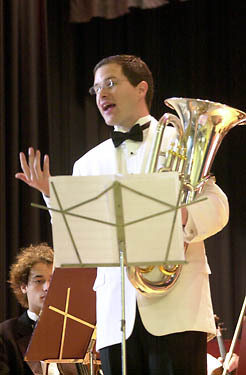 The concert drew a good crowd in spite of the magnificent fall weather, and those in attendance were treated to an incredible experience as guest artist (and consummate entertainer) Adam Frey showed us things we never knew a Euphonium could do! 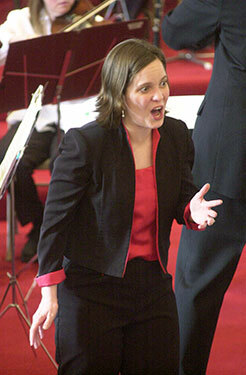 Did we say “consummate entertainer”? 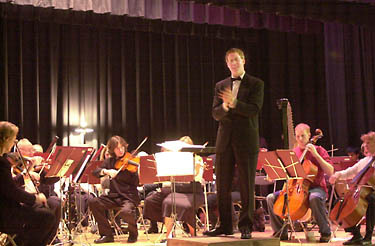 At the conclusion of the World Premier performance of Frey’s arrangement of Rule Britannia, Mr. Frey emerged for an encore. 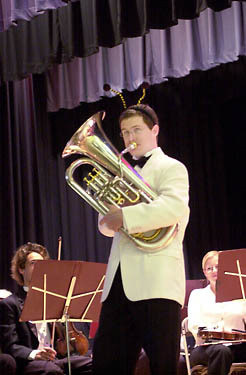 Let’s just say that if you have never heard The Flight of the Bumble Bee performed on a Euphonium, including props and a 360° rotation (of the instrument, not the performer), well… you need to get to more Parkway Concert Orchestra performances! 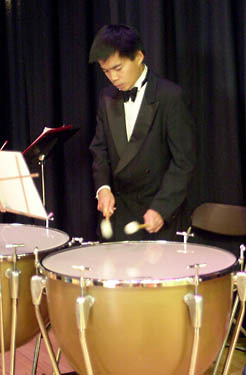 It was with pride and pleasure that the Orchestra “introduced” its beautiful new Timpani. 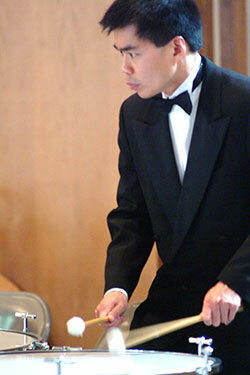 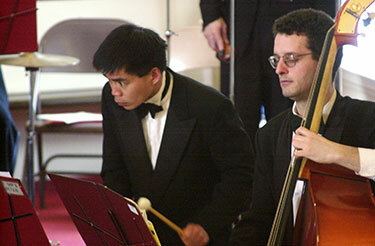 The instruments, performed by Edward Chen, will be an exceptional asset to the Orchestra. 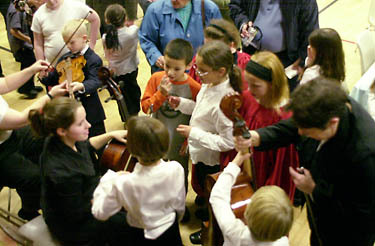 The Instrument Petting Zoo following the performance was a huge success. 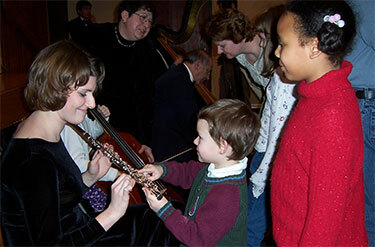 In these photos four very patient and generous musicians, Ellen Fox (Harp), Howard Ostroff (Trumpet), Pat Mancini and Nicole Giammarco (Cello), introduce eager young audience members to the “voices” of the Orchestra. 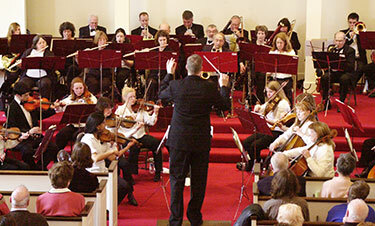 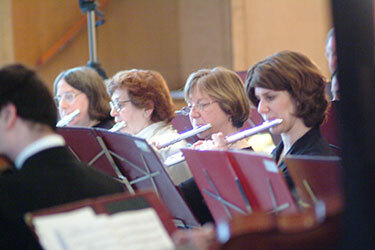 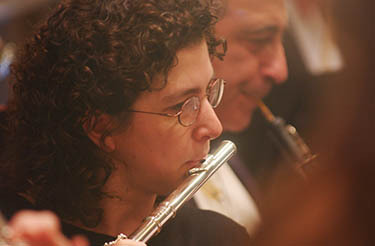 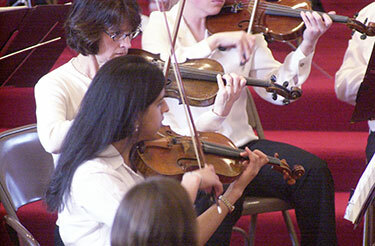 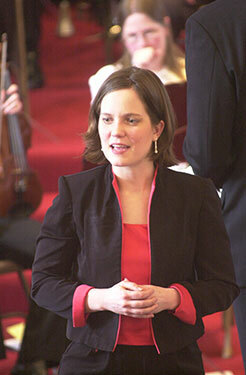 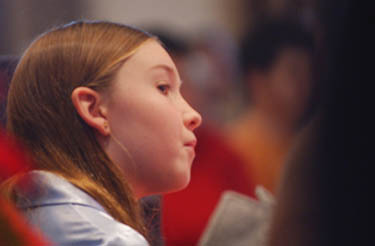 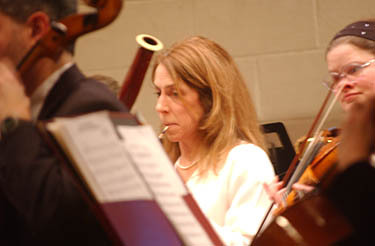 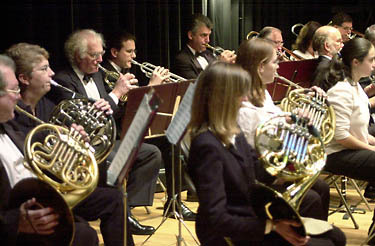 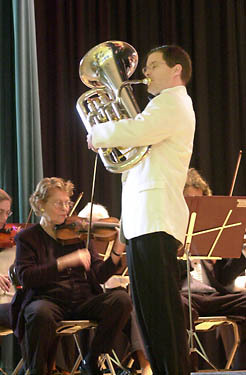 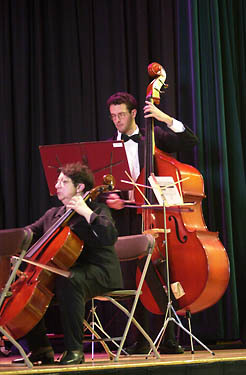 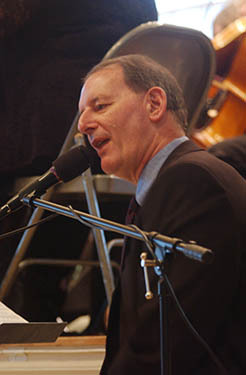 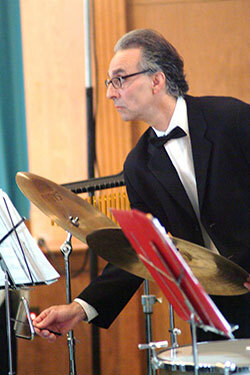 The accompanying orchestra, produced by Parkway Concert Orchestra music director Lawrence Isaacson, consisted primarily of Boston Conservatory students and members of the Parkway Concert Orchestra.